It's certainly no surprise to see the world's largest PC vendor primarily focusing on laptop announcements even at a major trade show dedicated to the mobile industry like MWC, but Lenovo also brought a gargantuan handset with dual 4G LTE support and some sleek-looking headphones to Barcelona. The somewhat confusingly branded Yoga ANC and X1 ANC Headphones seem to be pretty much identical apart from their paint jobs and snazzy logos. The Lenovo Yoga ANC come in a silky white color, while the X1 ANC will be offered in silver and black to match your ThinkPad X1 notebook. Of course, both models are compatible with mobile devices in addition to computers, providing a wired USB-C connection, as well as Bluetooth 5.0 technology. Bold move on Lenovo's part to not go with a traditional 3.5 mm audio jack, although you can obviously always use the headphones wirelessly if you don't have a USB Type-C port or if said connector is occupied. In terms of sound quality, Lenovo unsurprisingly enlisted Dolby's help to professionally tune these bad boys, which also rock an interesting combination of active noise cancellation (ANC) and environmental noise cancellation (ENC) capabilities. The former aims to eliminate "even the rowdiest ambient noise" to give you a "moment to yourself" wherever you may want to blast your favorite tunes, while the latter promises to "intelligently filter background noise during calls" so you "never miss a chance to chat." In other words, the Lenovo Yoga ANC and X1 ANC headphones should have you covered as far as both music and voice calls are concerned in the busiest, loudest environments. 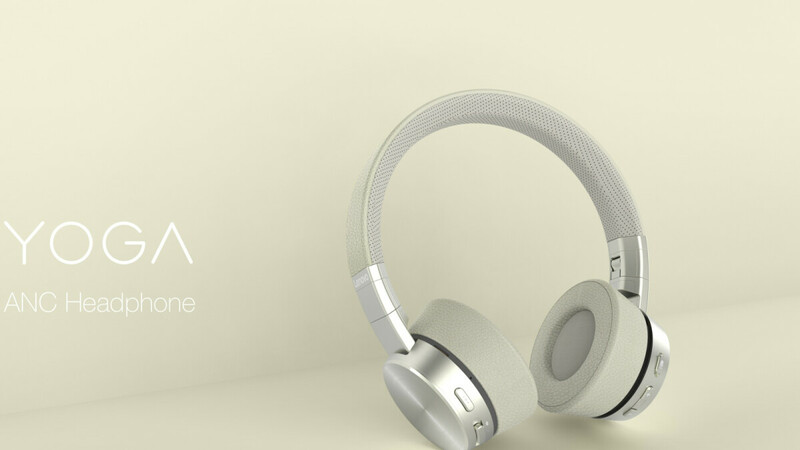 Capable of lasting up to around 15 hours on a single battery charge and needing less than two hours to go from 0 to 100 percent juice, these stylish headphones are made from silicone leather and "premium" plastic", with a touch of metal on top, tipping the scales at under 200 grams and "collapsing" so you can easily store and transport them. They're also fairly reasonably priced, starting at $150 but unfortunately keeping us waiting until June for a global commercial release. Both look good hope they perform well.